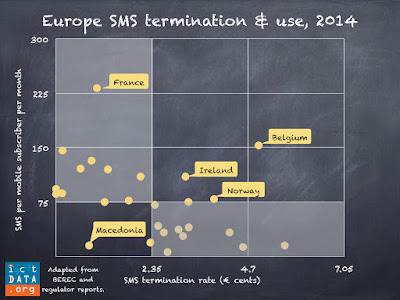 European countries with low SMS termination rates generate more text message traffic. According to the Body of European Regulators for Electronic Communications (BEREC), the simple average SMS termination rate in the region was €2.35 cents (US 3.13¢) per message at the end of 2014 (see figure below). The termination rate is the amount that one mobile operator must pay another mobile operator to deliver a cross-network SMS. In Serbia and Slovenia, there is no SMS termination rate. The highest rate is in the Netherlands (5.60) and the lowest in Denmark (0.15). SMS termination rate, 1 January 2015, source: BEREC (click to enlarge). The figure below shows a plot of SMS interconnection rates compared to the number of SMS sent per mobile subscriber per month. The average is around 75 SMS sent per mobile subscriber per month. All of the countries except one with below average SMS termination rates generate more than 75 SMS per subscriber per month. Macedonia does not fit the pattern with a measly 15 SMS per subscriber per month. Only three of the countries with above average SMS termination rates generate more than 75 SMS per subscriber per month. Of those three, it is likely that most SMS is sent within network, thereby unaffected by the termination rate. France, where the termination rate is one € cent, generates the most SMS traffic per user by some margin.